Digital pianos deliver greater sound than ever before when compared to traditional pianos constructed of built-in hammers and wooden cabinets. They are also less bulky, portable, and offer a variety of features that can lead to hours of creative musical exploration. There are many benefits to using a digital piano versus a traditional one. When they are of good quality, digital pianos are ideal for anyone looking to master their piano skills. In this review, we will look at the Yamaha CP4 which is well-designed and priced. A Yamaha CP4 state piano works almost the same as a grand piano. Other than the obvious differences in materials and construction, the Yamaha CP4 is a portable version of a piano. Its black and white ivory key tops and hammers are like a grand piano. Wooden keys deliver great sound. It has a sleek design and the finish is worthy of any stage. Yamaha pianos are durable. They have designed these digital pianos to last a long time. Yamaha uses high-quality materials and parts, constructed so that the end product is excellent. The CP4 keyboards have wooden keys which are responsive and play well. They are the dominant part of the keyboard. Yamaha guarantees their wooden keys with synthetic ivory key tops have a natural feel and smooth finish. You will find many controls on the left side of the front panel. These controls include a layer, split button, and voice control which will allow you to command the sounds you need. The control panel is intuitive and easy-to-use, making it a great digital piano for all technical levels of musicians. The finished construction is an elegant and attractive piano that will augment the beauty of any home. The Yamaha CP4 has an excellent overall sound quality. The high-quality wooden keys and keyboard design makes it easy for players to transition from acoustic to digital pianos. The controls interface is easy-to-use and user-friendly, making it one of the best on the current market. Yamaha keyboards are suitable for concert pianists who play before crowds and for home use. Beginners and players who want to improve their musical skills will also enjoy this digital piano. Layer and split controls allow you to split and layer sounds when playing with the press of a button. Lighted, larger buttons supply light to operate other controls when playing on a darkened stage. The Yamaha CP4 sound quality and playability is impressive. It yields clarity, warmth, and silky sounds. The keyboard includes grand piano and classical sounds. They have designed these digital pianos to have an authentic sound identical to Yamaha grand pianos. The Virtual Circuitry Modeling technology ensures that musical simulation and sound quality will exceed your expectations. The keyboard comes with several voices that pianists can command depending on their music material. Voices include organ, strings, bass, and many more. Players can also store their preferred sounds. This keyboard comes with electric and acoustic sounds and over 400 sounds based on leading MOTIF synthesizers in the industry. The Yamaha CP4 is lightweight, portable, and easy to carry. The keyboard has a slim design for easy handling and transportation. The keyboard weighs around 48 pounds in total. With all of its features, excellent sound quality, and performance, it is amazing. However, its portability does not diminish that it is ideal for static playing. When coupled with the Yamaha stand, the keyboard takes on the appearance of an elegant piano. Keep in mind, you must purchase stands separately, and they must be consistent with the size of your keyboard model. Even though the Yamaha CP4 models have not been on the market for a long time, there are no complaints about substandard products, durability or quality. It is a highly versatile keyboard that can play in any location and is easily carried to another without fear of damaged and broken parts. These digital pianos have a strong construction and will deliver as promised. This digital piano comes with a two-year warranty that covers manufacturer defects. With this length of warranty, you can have confidence that your investment is well-covered. Yamaha instruments also stand behind years of Yamaha’s experience in manufacturing excellence. Most, if not all, Yamaha keyboards last many years if you respectfully maintain them. They require minor dusting to eliminate dust and dirt from the exterior. Many parts on these pianos are black and avoid stains and discoloration. These Yamaha models range in price from $820 to $2000 depending on features and other model specifications. This keyboard comes with a variety of voices. Voices include organ, strings, and bass and many more. Players can also store their favorite sounds. It also includes classical and grand piano sounds, and 400 sounds based on leading MOTIF synthesizers in the industry. Layer and split controls allow you to split and layer sounds. Lighted, larger buttons supply light to operate other controls when playing on a darkened stage. They design the Yamaha CP4, like other Yamaha digital pianos, to be long-lasting and durable. They use high-quality materials and parts so that the end product has a great sound quality and appearance. The CP4 keyboard’s wooden keys are responsive, graduated, and have a natural feel. The keyboard comes with synthetic ivory key tops with a smooth finish. The keys are the dominant part of the keyboard and they set all control buttons on the left front panel. These buttons include layer, split, and voice control buttons. The voice control will allow you to command the use of sounds you desire. The Yamaha CP4 has an excellent overall sound quality. The controls interface is easy-to-use and user-friendly. This keyboard is suitable for concert and home use. The Yamaha P-115 provides over 14 voice options including Rock-organ and Wurlitzer. It includes piano samples from Yamaha’s best grand piano, the CF III Concert grand. It is one of the few pianos within this price range that offers this high-quality sound. Yamaha included string resonance which performs like an acoustic instrument. This keyboard also includes the split keyboard function. With this control, you could teach two children to play the piano simultaneously. For use and accessibility, Yamaha P-115 has a compatible app that will allow you to edit and save different settings in the keyboard. You can create custom settings with this application to personalize the keyboard and make it easier to compose and play. The Yamaha P-115 is an amazing instrument with many features and retails at a very affordable price. All Yamaha digital pianos have high-quality construction from a respected and established brand. Yamaha’s manufacturing excellence and experience has produced some of the world’s best pianos. The Yamaha P-115 falls into this category. They designed this keyboard with 88 graded hammer action keys balanced for a natural feel. Top notes are light and become heavy as you move towards the lower end. Keys feel and respond just like an acoustic piano. The keyboards responsiveness and reaction makes the Yamaha P-115 a logical option for virtuosos playing. In this price range, this keyboard offers an excellent sound quality. Yamaha included string resonance that performs like an acoustic instrument. They improved the keyboard’s ability for virtuosos performance. The keyboard received an upgrade to 192 note polyphony. This enables you to sustain different passages for extended periods while delivering a natural response like an acoustic piano. You can adjust key sensitivity depending on your mood, music, and performance. They designed the Casio PX 850 with ebony and ivory keys common to acoustic pianos. Yet, these keys don’t work exactly like a premium acoustic piano. However, they perform much better than plastic keys. Connectivity options are great. You can connect this keyboard to your mac or windows computer to use additional Casio piano features. The keyboard is fully compatible will these PC’s. Downloading drivers or software isn’t necessary. Connect your keyboard directly to your computer, and programs will launch. The Casio PX 850 has the highest note polyphony of any digital piano on the market. It is highly competitive over other models in its price range and out-performs other high-end keyboards. It has excellent 256-note polyphony which will allow you to perform complex passages without clipped or masked tones. This is an excellent quality for a digital piano, but that is just one of the great things about it. The Casio PX 850 comes with 88-touch-sensitive keys with Scaled Graded Hammer Action. They designed the keys to mimic the action of an acoustic piano. Depending on how fast or slow the differently sized hammers operate, sound output varies. You can adjust key sensitivity to three different levels. This is useful for players with different tastes. Regardless of how you play, the keyboard is comfortable and yields great sound. The Casio PX 850 is in the Privia product line. They design all keyboards in this product line with intelligent resonator technology. This technology delivers the true tones of grand pianos. With hammer response, strong resonance, and damper response, you will get authentic sounds of strings to accompany your composition when you use the damper pedal. The DGX-660 performs well in the connectivity department. It has many ports and connections making it versatile. You can connect the keyboard to other musical devices to improve the performance of this keyboard–most notably the port to three pedal units similar to the Yamaha LP7A. This feature is great for pianists familiar with acoustic pedal configuration. You’ll be able to use the half-damper function to change the clarity of the piano’s resonance depending on the pressure applied. The Yamaha DGX-660 also comes with many other features to make playing fun and creative. You can choose any accompaniment appropriate for any rhythm. It also includes a metronome that works alongside the damper pedal to change signature time and allow you to adjust sounds. The DGX-660 is considered by many as the ultimate “Portable Grand”. The DGX-660 looks and feels amazing. The Yamaha DGX-660 is like a “Portable Grand.” The 88-key piano comes with premium grand piano sounds that will meet and exceed the expectations of all levels of players. The interior and exterior construction is beautiful and high-quality. Yamaha manufactured this digital piano with great attention to detail. The keyboard has an attractive finish and comes with a synthetic wood grain stand. On the downside, the keyboard is not very versatile. You should not move it frequently, but occasional and responsible traveling should not be a problem. The Yamaha DGX-660 keys are plastic. Other digital pianos on the market use low-quality plastic which is undesirable. With the DGX-660, Yamaha used premium plastic construction that has great response and feel. The keyboard features a Graded Hammer Standard key-bed. This digital piano mimics the feel of a grand piano. Keys move from heavy to light, and you will notice the change in impact when you play. It performs well, however, you will notice the differences between an acoustic piano and the Yamaha DGX-660. The Yamaha CP4 is an amazing instrument that competes with both acoustic and digital pianos. If you’re looking for a digital piano with more features and wood-key construction, this would be the way to go. It has a wide range of features and retails at a very affordable price. The Yamaha P-115 is another great choice from our reviewed list. 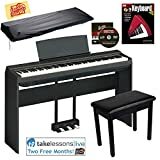 These digital pianos have some of the best sound quality on the market and will give you many years of piano playing enjoyment.